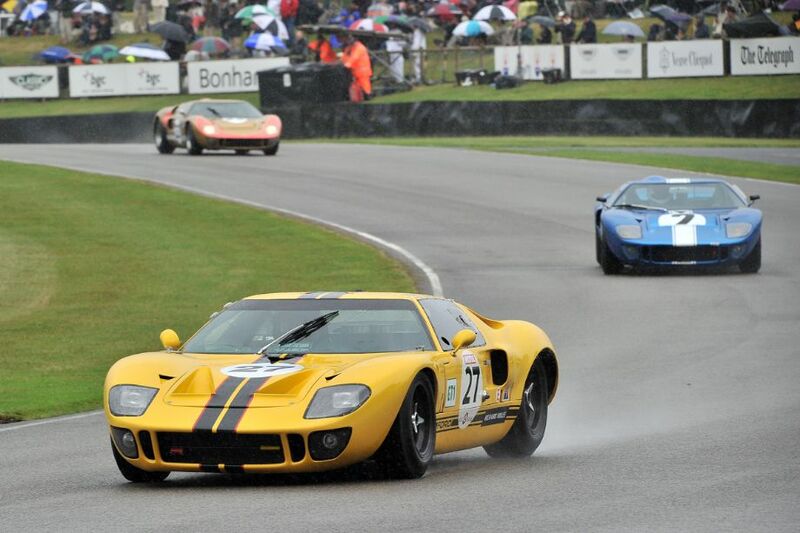 The Whitsun Trophy race at the 2013 Goodwood Revival was held Saturday, September 14th at the 2.4-mile Goodwood Motor Circuit in West Sussex, England. 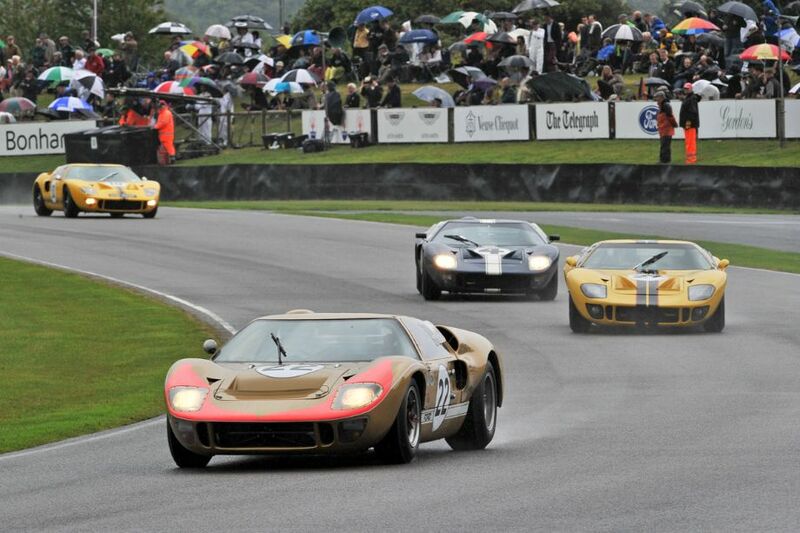 This year’s Saturday feature race showcased a grid exclusively made up of Ford GT40 variants, in celebration of the model’s 50th anniversary. 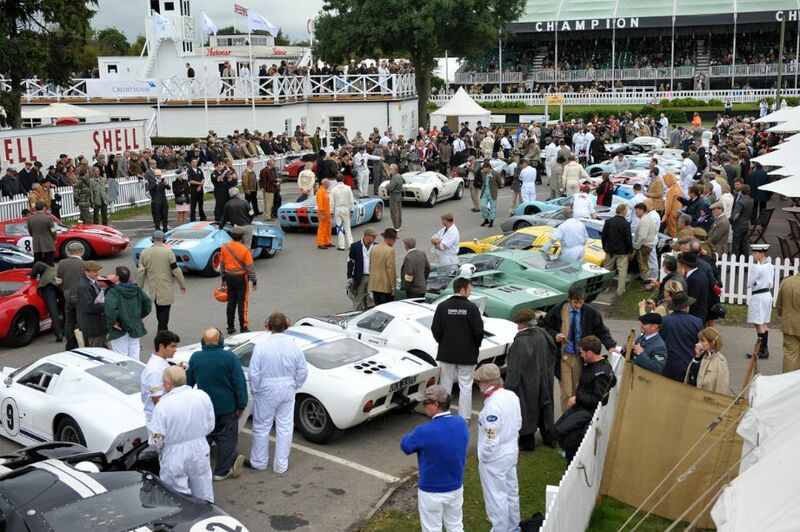 The one-model Whitsun Trophy race included the finest collection of significant and authentic racing Ford GT40s ever assembled in the UK. It was a 45-minute two-driver race, with driver changes in the pits between 15 and 30 minutes. 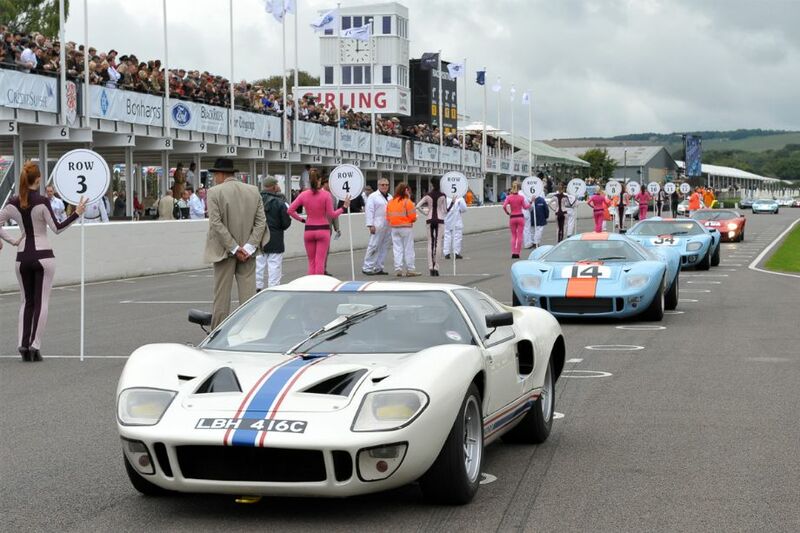 With such a mixture of GT40 racing cars, it made for a stunning spectacle and a fitting tribute to this four-time Le Mans-winning sports prototype. 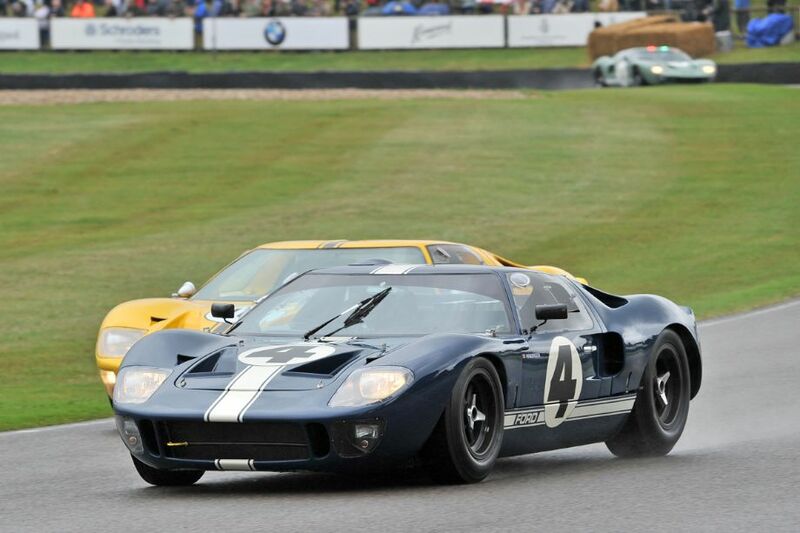 Although the first GT40 wasn’t completed until early 1964, the Ford project actually began a year earlier in 1963, when Henry Ford II – snubbed by Enzo Ferrari over the sale of his company to the Michigan-based automotive giant – set out to beat ‘Il Commendatore’ at his own game, with sights set firmly on victory in the Le Mans 24-Hours race. 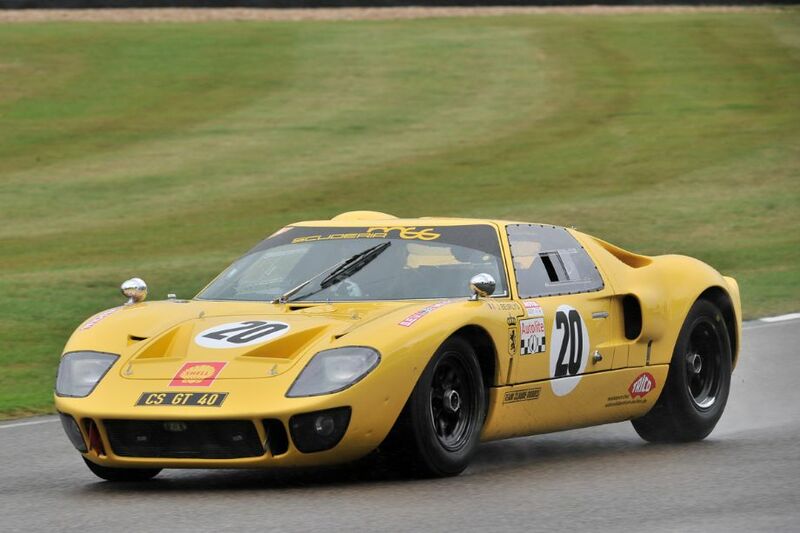 A Ford advanced vehicles operation was set up in Slough to deliver this goal and the GT40 program was led by Eric Broadley, who had engineered the Lola Mk6 GT that first raced in 1963, a closed coupe designed along similar lines to the GT40. The GT40 was created to meet with new manufacturer prototype regulations at Le Mans, and the Ford went on to become an endurance racing icon, winning the 24 Hours race at Circuit de la Sarthe four years in a row, from 1966 to 1969. 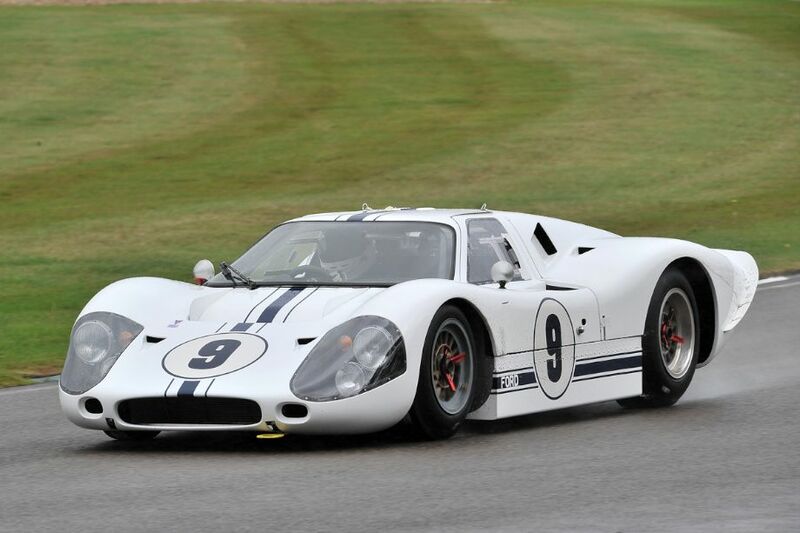 Of note, Goodwood played a key role in the development of this racing great, with Lola carrying out much of the initial testing at Goodwood as the GT40 evolved from the existing Lola Mk6 design. Red Bull Formula 1 designer Adrian Newey and former Indy 500 winner Kenny Brack claimed top honours in the 2013 Whitsun Trophy race. While Le Mans star Emanuele Pirro made the early running, and was leading by more than 20 seconds at one point, his good work was undone by a tardy driver change. The car’s owner Shaun Lynn emerged from the pits behind the always-quick Brack and was unable to make up the deficit, ultimately finished nearly 14 seconds behind the duo. 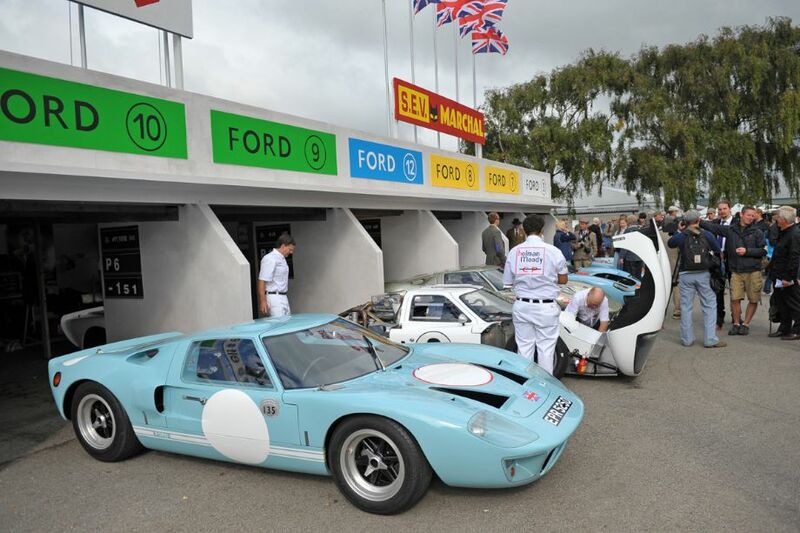 Similar to the one-model Fordwater Trophy 2011 race for Jaguar E-Types and the 2012 Shelby Cup for AC Cobras, Senior Photographer Tim Scott also documented the Whitsun Trophy race for Ford GT40s at the 2013 Goodwood Revival. We split up Tim’s pictures into two galleries. The first gallery starting below features our favorite images, all displayed in the full-width view of Sports Car Digest, while the second gallery and race results can be found on the last page of the article and gives a comprehensive view of all the photographs. To see more from Tim, visit fluidimages.co.uk.